Jen of selected this week’s Project Pastry Queen Challenge was selected by Jen of Sweet Morris: Peanut Butter Cups with Peanut-Penuche Icing. The cake portion of the challenge is one of the better peanut butter cakes I’ve baked. The crumb is tender, without being too dense and there’s plenty of peanut butter flavor. Other peanut butter cakes I’ve tried have either been too heavy or lacking in flavor. I was a little surprised the cake turned out so well because it calls for dark brown sugar – I was certain it was going to be heavy. – The mixing directions in the original recipe are a little less standard than most cake recipes, so I rearranged the mixing method to cream the butter, peanut butter, brown sugar, and salt for several minutes while gathering the rest of the ingredients. I then added the remainder of ingredients based on normal mixing methods. – Because I only had enough brown sugar for the cake, I opted to use a different frosting recipe (The World’s Best Chocolate Buttercream Frosting is below; it absolutely lives up to its name). – Only fill the muffin cups ~2/3 full – otherwise you’ll get spill-over. – I only added chocolate squares to half of the cupcakes because I knew that once the cupcakes completely cooled, the chocolate would return to it’s original hard state. Personally, I don’t find biting into something hard in the center of a cupcake very enjoyable – this would be better if filled with either a truffle (softer) or additional frosting using the cone method. The peanut butter cake recipe is definitely a keeper! Jen will be posting the full cake & original frosting recipes on her blog. You can check out how the other PPQ members fare this week here. 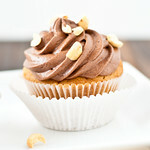 The chocolate buttercream frosting is currently my very favorite chocolate frosting. It calls for the unusual addition of Ovaltine (yep, that Ovaltine) for more concentrated chocolate flavor. It’s light, fluffy, and not at all overly sweet. On medium high, cream the butter, cocoa, and salt for ~3 minutes. Scrape down the sides of the bowl and add 2 1/2 cups powdered sugar, milk, and vanilla. Mix on low just until incorporated and then beat on medium-high for ~2 minutes, until smooth. In a small bowl, whisk together the cream and ovaltine. Scrape down the sides of the bowl and stream in the mixture with the mixer running on low. After most of the liquid has mixed in, slowly increase the speed of the mixer to medium high and beat for ~2-3 minutes, until light and fluffy. If your frosting looks grainy, it's either a little too warm in your kitchen or it wasn't mixed on a high enough speed, for long enough. I had the first problem so I put the bowl in the fridge for 15 minutes and then remixed it until smooth. Beat in additional powdered sugar, if desired. Pipe or spread onto your cakes, as desired. Additional frosting will keep well-covered for ~1 week in the fridge. These sound lovely! I’m so glad these were chosen for PPQ this week. I need a good cupcake recipe! 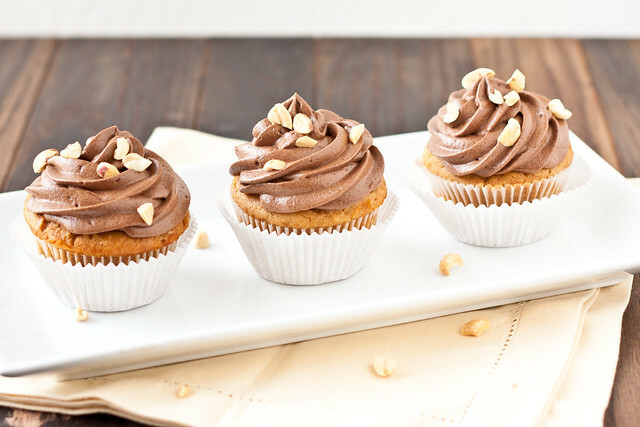 I love PB Cupcakes, look how cute they are, I bet they tase delicious as well! Okay, I mean OBVIOUSLY I have to make these. I would lose my card carrying peanut butter fanatic status if I didn’t! Oh my gosh, these look amazing! I think I’ve made a similar version of that frosting before from Sweetapolita’s site – I love it too! I’m going to have to try this frosting recipe. I’m not a fan of the recipes with sour cream in them, and I have a great chocolate ganache frosting recipe, but it’s kind of expensive. Love the idea of ovaltine. This chocolate frosting looks absolutely amazing. I must try it out. I somehow have never made a peanut butter cake. I need to remedy that. The chocolate buttercream frosting looks delicious. Thank you for the recipe. When I pull up the recipe, I don’t see peanut butter on the list of ingredients for the cupcakes. So how much did you use? Step 4 shows adding peanut butter. I made a mistake on my blog and didn’t list the peanut butter. It should be 1/3 cup of peanut butter in the cupcake recipe. I have updated the blog. I am sorry about the inconvenience. The recipe for that frosting looks awesome. I have the perfect cake that would go with it! Just made this frosting, DELISH! Not too sweet and very light and fluffy. Going to let it sit in the fridge for about an hour to firm it up before piping it on some peanut butter cup cakes!